If you have a smartphone or tablet, you are probably familiar with mobile apps. Most of you are already using mobile apps to make work tasks easier and turn your smart device into a fully functioning extension of yourself. Mobile apps are available for just about everything, including lighting controls. There are lighting apps used for configuration, for control, or both configuration and control. Some of these apps can work without an internet connection and all apps should require a token or login credentials to keep your facility and information safe. Below is a breakdown of the common pain points that a mobile lighting app can address for contractors. Requiring physical access to the device can be challenging. If the lighting device is ceiling mounted, this means getting out a ladder, bringing it into the area, climbing the ladder, completing the programming, and climbing down the ladder. This process can consume valuable time leaving you feeling like I wish there were a better way. Programming every lighting control device can take a significant amount of time doing the same thing over and over again, increasing the likelihood of errors. If you have a large room or space and all devices have the same setting, you have to go to each device and individually program. The repetitive nature of this process can take up valuable time that could be devoted to other aspects of the project. Programming using software requires a laptop dragged to each position, not to mention the learning curve associated with understanding the capabilities that each provides. Even though laptops are somewhat mobile, using software still requires you to find a surface to work comfortably and connect the laptop to a physical connection. Repeating this step at each location, you have to bring the laptop and connect to the lighting control devices, then run through the steps to program. Even though software provides a wide range of functionality, you may only need to program a subset of the features and functions. Returning to the job site to fix errors made programming lighting systems can cost you time and money. Requests for minor tweaks to the lighting system for occupant comfort can also result in getting called back to the job site. These return visits can take up a contractor's valuable time that could be spent on other projects. Getting the job done and navigating the logistics of scheduling and getting materials to the site is a significant concern for a contractor. The ability to program lighting systems on your time with zero delays would help to keep your project on time and within budget. Contractors now have mobile lighting apps to startup and program lighting networks and sensors faster and easier. If you want to get on and off the job more rapidly, mobile lighting apps can help. Mobile lighting apps take advantage of a lightweight, portable tool you’re already using. Most of us carry our smartphone wherever we go. Mobile lighting apps put the power of programming in the palm of your hand providing an alternative to push-button programming and software solutions. Mobile lighting apps do not require physical access, a ladder, or lugging heavy equipment around. The mobile lighting app solutions in the marketplace use various technologies and have different feature sets. Using a trusted business partner is important when selecting an app that meets your needs. There are several mobile lighting apps to make startup and programming of your lighting networks and sensors easier and quicker. Mobile lighting apps provide contractors with a time saving, more efficient alternative to startup, program, and update lighting sensors and networks. Please check out the resources available to further investigate the different solutions in the marketplace that meet your needs. If increasing revenue is important to you, mobile lighting apps can help you get on and off the job faster. 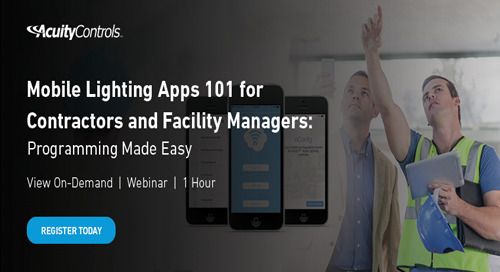 Learn about mobile lighting apps and how they can help facility managers improve operations. 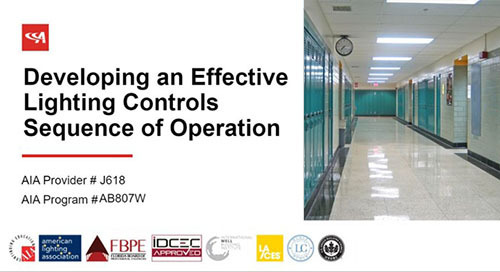 Discover how codes, design trends, and system integration influence the design and implementation of effective lighting controls strategies based upon a desired sequence of operation. 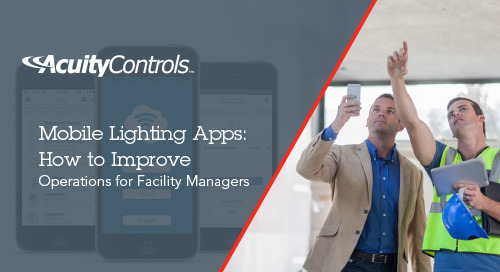 Learn How Mobile Lighting Apps Can Help Contractors Reduce Time on the Job and Facility Managers to Improve Operations.